ORGANIC HEMP SEED OIL - Hemp oil is regarded as the most perfectly balanced oil available in Nature. Our hemp seed oil provides unique health benefits and offers ideal 3:1 ratio of Omega 3, 6, and 9 essential fatty acids. It is beneficial for heart, improves brain function and is good for joints, mental state, skin and hair. PROVIDES PAIN RELIEF AND JOINT SUPPORT, REDUCES ANXIETY - This premium hemp seed oil has been found to be very effective in reducing anxiety for some. It may also help with reducing pain and improving joint health. GLA (a type of Omega 6) found in hemp oil has been reported to fight against inflammation and reduce nerve pain. BOOSTS IMMUNITY, IMPROVES SLEEP AND SUPPORTS BRAIN FUNCTION - Our hemp seed oil may enhance immunity, improve brain function and is beneficial for the overall health of the brain. Many people have reported that hemp oil has helped them with better sleep. BIOAVAILABLE SOLUTION, IMPROVES SKIN AND HAIR - Our hemp oil drops are extracted from raw hemp seeds and then processed in a way which keeps all of the nutritive elements in ideal bioavailable form. 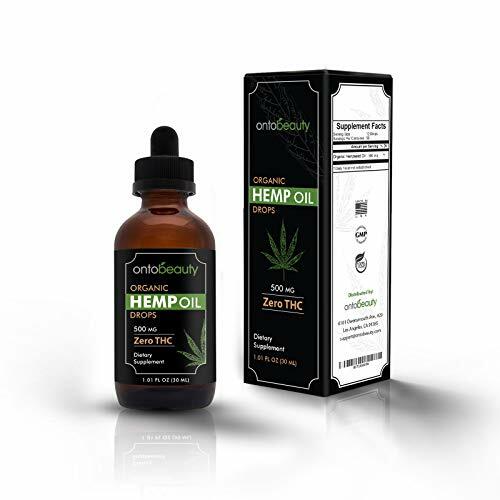 This o3 hemp oil comes in an easy to take liquid extract form. Thus, it is readily absorbed by the human body and provides full and effective health benefits. MADE IN THE USA IN AN FDA AND cGMP REGISTERED FACILITY - Finest quality hemp oil 500 MG, we give top priority to quality and offer a full and hassle-free 30 days money back guarantee. If you are not satisfied with the product, you can return it within 30 days to get a full refund. 30 ml (1.01 fl oz) in Amber Glass Bottle with dropper. One serving = 12 drops. One bottle contains 50 servings. Dosage - 3 servings a day with water or as recommended by a Physician.